Pals playing RPGs… in a club! RPG Pals Club #001 – Bar Fights! The City of Waterdeep holds infinite stories, and this is but one of them as a group of adventurers are drawn into a bar in the City of Splendors and will soon find themselves caught up in danger, intrigue, and doggos! Good stuff! Looking forward to your further adventures. 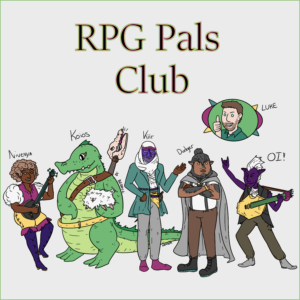 RPG Pals Club #007 – A Night at the Opera! RPG Pals Club #006 – Shopping Spree! RPG Pals Club #004 RPG Pals Vs. The Floating Eyes Of Death! Dovi on RPG Pals Club #001 – Bar Fights!